Purported Intel documentation referencing and detailing a pair of top-end Intel Core 9000 Series processors has leaked onto the internet. The images were first shared on the Chinese language Benchlife MIT forum and spotted by many western tech news sites after being published on VideoCardz. The information, if true and correct, highlights encouraging specifications for the upcoming Intel Core i9-9900K and i7-9700K processors. Above you can see a slide which establishes the processor names, families, TDPs and sockets. To me this slide looks a bit dodgy as the Trademark/Family name row says that the i7-9700K is part of the Intel Core 17 family. That's quite an obvious and glaring typo, even if almost obscured by the 'a' of the green watermark text. The second slide is the source of today's Intel Core 9000 Series headline. It lists the Max Core Turbo Frequency on various core counts. To start we must restate that current rumours point to the upcoming desktop Core-i7 chips offering 8C/8T and the i9 chips 8C/16T. Both processors operate at a base frequency of 3.6GHz but, as usual, turbo frequencies come down as more cores are utilised. Looking at the Intel Core i9-9900K first, it can run at a turbo boost speed of 5GHz on one or two cores. Four cores can run together at 4.8GHz, and it can utilise 6 or all physical cores and still achieve 4.7GHz. Please refer to the table for the turbo speeds with regard to the Core i7-9700K. The new documentation leaks agree with previous information we have seen regarding multi-core turbo speeds. Intel's Core 9000 Series processors are expected to debut in late September. At the same time new Intel Z390 Series chipset motherboards should hit the market. We have recently reported upon motherboard makers updating their earlier 300 Series motherboard BIOS files in readiness for the new range of desktop processors. I am curious if the TDP is aligned with that 8 core boost. I would be incredibly surprised if it could boost that high for a decent length of time and stay within that TDP. …and all you need is a enterprise-sized AC to cool it off, or a steady flow of liquid N.
What kind of cooling is going to be needed for this? They might be the best chips to get for the next 5 years but I don't want a nuke cooking me, lets see what AMD bring with Zen2. @Tabbykatze: The Intel TDP is always for a heavy multi-threaded workload at base-clock. So the answer is no. If you compare the i7 8700K and i7 8700 they have just about the same turbo clocks but the TDP value differ by 30 watt. That doesn't mean the i7 8700 use less power at those turbo frequencies. It have a lower base-clock to match that lower TDP. It's at that clock it do use 65 watt. So if you want to make a machine where you'll only let it use 65 watt then you can use that one and for heavy multi-threaded loads it will still reach the base clock and for less heavy multi-threaded loads or single-core loads it will boost higher. If you only allowed the 8700K to use 65 watt though then it wouldn't be able to reach its listed base clock with a heavy multi-threaded load. Usually motherboards allow them to pull 140 watt though and then they can reach their higher boost clocks even with heavy multi-threaded loads. But the TDP value is for base clock when the load is heavy. @Glyce: The 9700K and 9900K chips are rumored to have a soldered heat-spreader rather than using TIM meaning heat transfers better from the die to the heat-spreader making them easier to cool. Actually I guess the TDP in Intels case may also not be electrical power draw but rather what kind of cooler you need. Though they should still be strongly correlated. Why I mentioned that is because the i7 8700K also have 95 watt TDP with 6 cores at 3.7 GHz base vs 9900K with 95 watt with 8 cores at 3.6 GHz base. Intel may have rounded those numbers off to the 15/35/65/95/(140?) 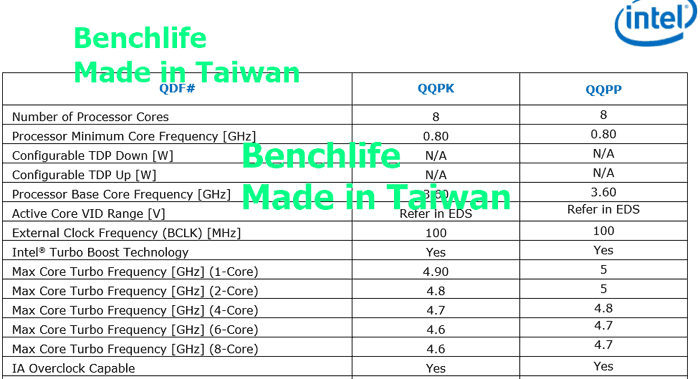 values but if not and manufacturing process haven't changed much what I meant is that maybe the solder there is enough to put the same cooler requirements for the 9900K as for the 8700K even though it do have two more cores running at 100 MHz less in this case. The 8700K stock without AVX load isn't too hard to cool. It's overclocked and with AVX it become very hot. Ryzen require much higher voltage very fast if you try to overclock it too with similar result. The Ryzen chips do use solder. @Fury559: Zen2 CCXes are rumored to have 6 or 8 cores. If AMD just go with one per Ryzen processor that of course wont increase the amount of cores we have vs now though the manufacturing process also promise higher performance or much lower power draw but I guess that's highly unlikely and more likely we're looking at up to 12 or 16 core Ryzen 3000 series processors. Given a claimed ~60% power draw drop or ~35% higher performance from the manufacturing node (and 2.8x the density) those chips would either still have higher performance than the 9900K but draw quite a bit less power or have quite massively higher performance and much higher in the 16 core case. So for multi-threaded loads it will unlikely be much of a competition. The design of the CCX may also improve somewhat. I wouldn't necessarily put much money onto AMD changing infinity fabric to something else completely removing the added latency it have in some conditions, on the other hand with “higher performance” come higher clock and that higher clock likely includes both the infinity fabric and memory controller which mean that with the same design of those latency will drop some anyway. Also Intel is unlikely to make a 12 or 16 core ring-bus design CPU and more cores there add more latency too I assume. Intel invented their mesh bus for more cores. Ring-bus is likely slower with very many cores.